On the Apple Menu, click "System Preferences." In the System Preferences application, click "Sound," then click "Input." Click "Internal Microphone" to use your Mac's built-in mic with Auracle, or click the name of another audio input device to use it instead. Say something. If the microphone is working, then the "Input Level" meters will light up. 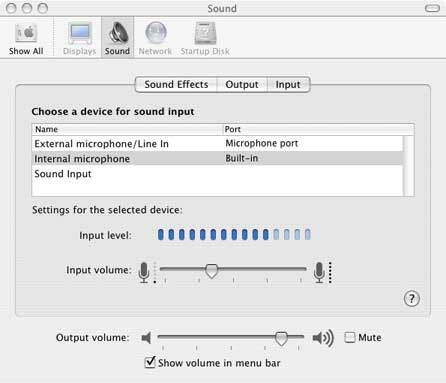 If "Internal Microphone" is not listed, then your computer does not have a built-in mic. You will need to use an external microphone with Auracle. In the System Preferences application, click "Sound," then click "Output." Click the name of the audio output device (usually "Headphones" or "Internal speakers") which you want to use with Auracle. Adjust the "Output volume" slider at the bottom of the window. When you release you mouse button, you should hear an alert sound.